Dealing with a Life Change? A bend in the road sometimes requires a measure of faith. Ruth must have been a pretty strong woman to swing that flail over her head and beat down on the barley she gleaned from Boaz’s field. I had enough trouble a few weeks ago, trying to hold and start our gas-powered weed wacker! And, if your familiar at all with Ruth’s story, you know that she had to use that strength in many other ways as well. You see Ruth faced many challenges when her husband died. Suddenly, she was a woman trying to make her way in a man’s world and nothing was “for certain” anymore. Ruth could have played it safe and stuck with her own people, the Moabites, after her husband was gone. But she chose instead, to follow her widowed mother-in-law back to her Jewish homeland, saying: “… Don’t urge me to leave you or to turn back from you. Where you go I will go, and where you stay I will stay. Your people will be my people and your God my God” Ruth 1:16. And I’m sure that Ruth was more than a little frightened at the risk she took. Have you ever experienced a time in your life when, like Ruth, you faced an ending to what was “normal” for you? And, maybe you couldn’t quite see how your life was going to carry on from there? I remember when I was in college and dating a man I thought I was going to marry. An unexpected break up ended all my dreams and suddenly I was left without a plan. Shortly after that, I was driving on a country road a little lost one day and thinking that that road was a lot like my life. Because I had no idea what was around the bend. It’s a scary feeling isn’t it? And I’m thinking that Ruth must have felt the same way when she chose to stick with Naomi and journey to Bethlehem with her. 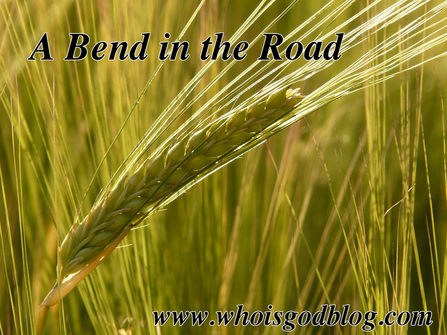 But God had a plan, as you may already know, and Ruth “just happened” to pick the field of Boaz (a relative of Naomi’s deceased husband) to glean the leftover barley in one day. And as the story goes, Ruth finds favor in the eyes of Boaz and eventually becomes his wife. In other words, if Ruth hadn’t landed in the field of Boaz, would she have survived? And Barry Adams from “365 Promises” wrote this in today’s daily devotional: “Have you ever come to a fork in a road and not sure which road to take? I know that often when I have gone hiking, there inevitably comes a time on the trail where it splits off to the right and then left and I am not always sure which path to take. Wouldn't it be nice if at that exact moment, you had a trail guide standing behind whispering in your ear what to do? Are you, like Ruth, stepping out in “unchartered territory” today? And have you no idea what’s around the bend? Walk with God and honor him with your choices and you’ll have the best guide in the whole world.